Clint Neufeld’s sculptures involve an intricate play between contradictory forms, materials, and purposes. For the last few years, the Saskatchewan-born artist has been working with the most “Saskatchewan” of forms: engines, excavating buckets, and other mechanical devices that are employed with great frequency throughout the province. Yet, unlike the real objects, Neufeld’s sculptures are not made with industrial materials. Rather, they are lovingly handcrafted from such substances as porcelain and wax. Neufeld works with concepts of masculine identity, his pieces present a dichotomy and a romantic tension between masculine and feminine clichés – delicate motif and car envy. 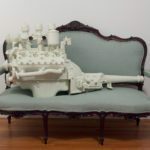 Over the past five years, his ceramic engine sculptures of have won increasing recognition in the Canadian art world. In addition to having been featured in MASS MoCA’s Oh, Canada show last spring, Neufeld has had solo exhibitions at public art galleries across the country and was first runner-up for the 2011 Winifred Shantz Award for Ceramics. Prior to pursuing a career in art, Neufeld spent three years with the Canadian military, which included a deployment to the former Yugoslavia in 1994. After a failed attempt pursuing a career as a firefighter, Neufeld began his BFA at the University of Manitoba in Winnipeg and finished at the University of Saskatchewan in Saskatoon. In 2006 he completed his MFA at Concordia University. He now lives and works on acreage near the town of Osler, Saskatchewan.